Taiji and the Golden Ratio (Chinese Only) demonstrates the connection between the Taiji energy field and the Golden Ratio. Although there are countless manifestations of the golden ratio in nature, there is no widely accepted scientific explanation for its existence. Dr. Andrew Wu introduces the concept of the universal “Taiji energy field” and how it manifests itself in nature, humans, and the planets. It is due to this Taiji energy field, that we see the manifestations of the golden ratio. 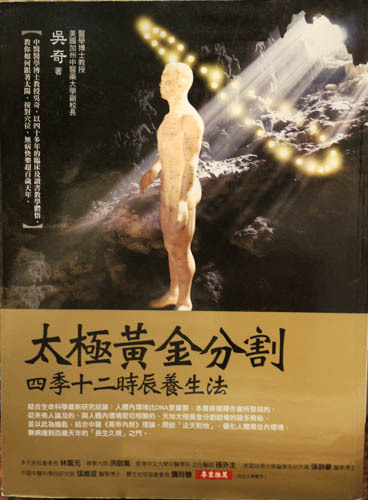 The book also shows how humans can harness this Taiji energy field to promote healing or general well being. Dr. Wu introduces exercises and meditation methods that the reader can practice easily at home. This is Dr. Andrew Wu’s newest book, published in late 2012.